At the age of 20 New Zealander Dave Ryan did what many of his fellow Kiwis did. He set off to visit Great Britain! He has been there ever since. When he arrived in London in 1974 Ryan had already competed in speedway events in New Zealand, his interest in the sport sparked by the successes in the late 1960s of Denny Hulme, Bruce McLaren and Chris Amon, New Zealanders who were, at the time, among the top names in Grand Prix racing.He had dreams of continuing his motor racing career in Britain but as he had no money he needed to work and did the logical thing and applied to join McLaren - the Kiwi team - at Colnbrook, near Heathrow Airport.At the time many of the McLaren mechanics were from Australia and New Zealand and even the English team manager Alistair Caldwell had been brought up in New Zealand. Ryan was hired as a mechanic. McLaren had won the World Championship that year with Emerson Fittipaldi but there were changes afoot. The last of the Kiwi drivers Denny Hulme retired, to be replaced by Germany's Jochen Mass. Fittipaldi battled for the World title in 1975 with Ferrari's Niki Lauda while Mass, with whom Ryan was working, won his first victory in Barcelona. It was a sad affair as the race was stopped before the halfway point after Rolf Stommelen crashed his Embassy Hill over the barriers, killing four people.At the end of the year Fittipaldi quit the team to drive for his brother Wilson's Copersucar operation and Mass was joined by James Hunt. Ryan continued to work with Jochen but it was Hunt who won the 1976 title. For 1977 Ryan had a new boss, chief mechanic Gary Anderson (later the technical director at Jordan), and he continued with Mass and then Patrick Tambay. For 1979 Anderson moved to Ensign and Tyler Alexander returned from America to run the team but there was no success in that season or in 1980. At the end of that year Marlboro forced Teddy Mayer to merge the operation with Ron Dennis's Project 4. There was a big switch around of personnel in the months that followed but Ryan survived and in 1982 became the team's chief mechanic. At the same time he tried his hand at Formula Ford 1600 races but by then was only racing for fun.He remained chief mechanic throughout the successful McLaren-TAG years but in 1987 decided to stop traveling for a while and became the McLaren factory manager. 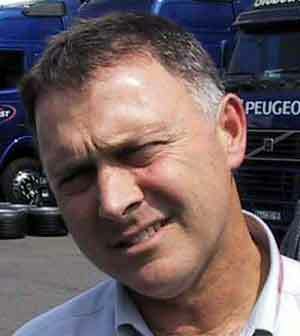 In 1990 he became the team manager, working alongside Ron Dennis and team coordinator Jo Ramirez. He has been in that role ever since.